The message below may seem a little jumbled because there is a lot going through my head when I think back on the year. Please work with me! Beta Cycling is back. With the best team performance since 2002 (Beta got 4th lead by our coach John Grant), I can proudly say that the cycling program is back. I could not be more happy with our year. For those of you who don’t know, we finished 5th in this years race! Below I will have a race recap of the race for our team. This year has been one of the best of my life. I think Saturday was probably one of the best days of my life to date. All of the work that we put into riding our bikes paid off. 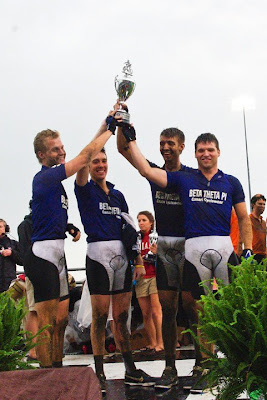 After last year’s race, I thought seriously about what it would take to have a competitive team in next year’s little 500. I knew that it was going to take a new team, guys that really wanted to ride, and a lifestyle change focused primarily on the bike. There is an important difference between the fact that we had guys that “wanted” to ride versus “forced.” You cannot force what happened this year. Our team wanted it. With three rookies and me as the only returning rider, I had a ton of work to do in making the program competitive. Luckily I was blessed to have three studly rookies. These guys not only pushed themselves, they pushed me… Sometimes to points where I would get down on myself because it seemed that they were getting better and my abilities were going south. There were very few moments like that… i can beat all of them! haha. I am sure they will laugh at that. We did a TON of new things this year. The winter trip to South Carolina was a totally new experience and we threw that together very last minute in order to have a winter training trip. 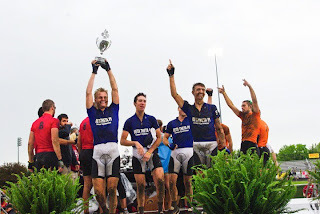 Spring racing for the Indiana University Cycling Club was also a new experience. We were very successful in those races picking up a few wins and many top 10 finishes. Spring break in Bloomington was new for us too. With an actual training plan and some routine to our schedule, we were able to incorporate both aerobic and anaerobic workouts into our days. The next two points are the most important. This year we were actually a team. In the past, we have been 4 or 5 athletes who try to ride bikes and be competitive. This year we successfully molded as a team and understood each other’s strengths. We were always there for each other and truly worked together to be successful. I have never been as close with 4 other guys in my life. Finally, we actually raced in the little 500. 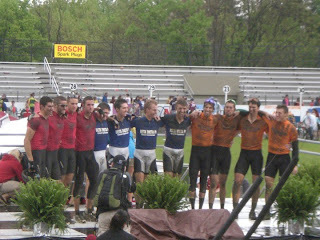 There have been many people who have ridden in the little 500 but very few who have actually raced. We were competitive and we raced. With four rookies returning and a house full of guys who are suddenly really interested in biking, the team is built to be competitive for a long long time. I am super excited to come back and help out. This has been a great experience for me and the team. Thanks again for all the support! Alumni, friends and family have been a huge factor to our success this year. In total, including the place to stay in South Carolina, we raised over $2,500. What a success!!!! Take a look at all the names on the right of this blog. Those are the people that gave us some cash to do the things that we needed to do in order to be competitive. My hat goes off to all of you who have helped spread the word of this blog, and have been active readers. I am not the best writer but it was my hope to translate what the team is doing to you! Someone on the team next year will step up and write the blog to keep everyone informed. Everyone knew that it was going to rain. The rain was a matter of when and not how much. We took the race 50 laps at a time. Anderson started the race for us with about a 12 lap set. His effort was great and kept us in contention though the high speeds of the first few laps. Green got on the bike next for a strong 8 lap set. I was on after green for 7. My set was SUPER FAST and I started to struggle a little and had to jump out. After that first set though, I felt great. It opened up my lungs and got the blood going through my legs. Ong put out a strong effort to keep us in it. That was the first 50. There were a few times when we were setting the pace but for the most part, we sat in the pack and let the other teams do a lot of the work. We tried to race as conservatively as possible to stay in contention for the entire race. The rain started to come down in the middle of this block. The track turned to glass and if you were anywhere on the outside of the pack, you were probably going to eat cinder on the turns. At about lap 90, the pace started to pick up due to the fear of lightning. If lightening struck, the race was over. Or so we thought. I was in at lap 93 or so. The track was a mess. There was a lake in turn four that caused a few guys to slip and slide on the cinder. The leaders saw this and booked it. I got caught behind this guy that slid out and ran over him and his bike. By the time I was recovered, the leaders had a 1/4 lap on me. I came out and we put Ong in to finish what we thought would be the race. At lap 104, the race chief gave the red flag which mean that the race was over. At this point, there were only 5 teams on the lead lap and we were one of them. We were in 5th. We had a mini celebration and then got word that the race was still on. Our team was pumped because we still had a shot at advancing in the field. The race was restarted about 40 minutes after the red flag was thrown. We were saved by this restart. Since we were never passed by the race leader before the red flag, we were still on the lead lap. This was great news because when they did the restart, we were lined up right behind the leaders and we were back in it! It was a super exciting feeling and we knew that we had a better shot now to win. We were competitive these laps. This is the part of the race where we really stepped in and started to set the pace a little bit and tried to string out the field. We did our fair share of work and had some great burnouts to really keep our team in the race for the final sprint. We were pumped to make it to this part of the race. By this time we had basically secured a top 5 finish because we were one of the 5 teams on the lead lap. Fiji had a great effort in these laps and caught back up with the pack making it 6 teams on the lead lap. There were 6 of us in the final sprint. Our sets in this part of the race were awesome. Everyone left everything on the track and we really had some strong burnouts that gave the next rider plenty of time to jump on the pack for their last set. The final 3 laps were awesome. Eric Anderson finished the race for us. We had the legs all day to be competitive and to be in this final sprint was an amazing feeling. Eric did his best and we came out with a 5th place finish… only a few seconds off the leader. I had the time of my life in that race and this year leading up to it. Thanks again to everyone that helped and has supported us throughout the season. Look out next year… the team has its mind set on the win. Great year guys! We'll be watching next year;) Get after it this summer. Congratulations Erik, team and house. Thank you for your hard work and sacrafice. We need a summer update! !